Home » All of Deb’s tales of travel and tech » Deb's Travels » Polly Creek — a must-do boat ride in Roatan! 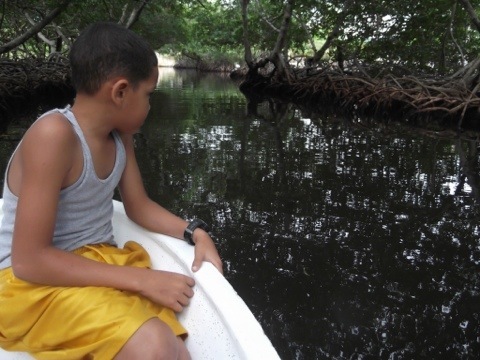 Polly Creek — a must-do boat ride in Roatan! Delia took me, Moorie and Sharia on a boat tour to show me some more of Roatan’s magic. We drove past Jonesville. I have passed the sign for the road down to Jonesville several times from the main road, but not known it from the ocean. Then we passed Bluerock. Then I learned the reason for this trip — Polly Creek (Pronounced Pole-y) — a long narrow waterway cut through the mangroves. I took video of it. On the way back we stopped at Lucy Point to sit, enjoy the view and have some snacks.